You have probably never heard Paul Grabowsky play piano like this. In fact, you may not have heard many people play piano like this. The Antripodean Collective is an opportunity for Grabowsky and four fellow Australian musicians of the highest caliber to exercise (and exorcise) their improvisational talents. Improvisation is one of the cornerstones of jazz but it is often neglected as the results can be hit or miss (quite literally!). When it’s good it’s very good and when it’s great it sounds like this. “The Massacre of the Egos” represents one of the most adventurous albums in the history of Australian improvised music. Take five exceptional musicians and put them in a pressure cooker situation and see what results. Fortunately those five musicians are Scott Tinkler, John Rodgers, Philip Rex, Ken Edie and the legendary Paul Grabowsky. Even though each musician has played together in different groups in the past, this was the first time this quintet as a whole had played and improvised together. The experience, in the words of Scott Tinkler, was an “Intense exploration of ideas” where “Ego is put up as collateral and it is confronted and dealt with on many levels by the others at hand”. The outcome is nothing short of miraculous! “The Massacre of the Egos” heralds another milestone in improvised music and shows the Antripodean Collective are more than capable of exploring the boundaries of music. 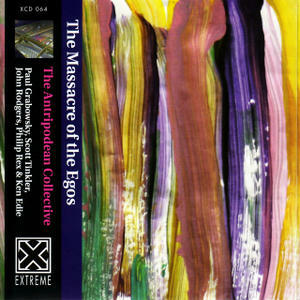 “The Massacre of the Egos” is the fourth part in the Antripodean™ series of releases on Extreme. The Antripodean™ series is a collection of works showcasing Australian artists exploring the boundaries of music. To play improvised music one must have a strong idea of what it is you want to play and how it is you want to sound, in addition to being attuned to the other sounds being created. On the most part we create a musical environment that we feel comfortable in and choose musicians that understand and are empathetic to the direction we want the music to take. Asking another artist to join your plight somewhat negates their total freedom in the sense that they are now endeavouring to support your musical ideals to at least some degree. This surrendering to the greater cause requires at least some gentrification of the Ego in order for the whole to be greater than the sum of the parts. Enter Roger Richards from Extreme and the formation of an ever-changing group of improvising musicians called The Antripodean Collective. Through his curatorial role, Richards brings together improvising artists to create music in a situation that removes both the responsibilities of leadership and the limitations of being a sideman. Richards wishes to create situations that challenge the musician’s, and listener’s, comfort zones. For the musician, this means intense exploration of ideas and the need for immense strength in the delivery of those ideas. The bottom line being that your Ego is put up as collateral and it is confronted and dealt with on many levels by the others at hand. Indeed this goes so deep that you might not even realize what has gone down. Certainly each musician involved will have differing ideas of what in fact did happen. This was an extremely challenging two days in the studio and what you will hear is only the morning of day two. The gruelling first day was time well spent tackling our differences, uncovering our similarities and finding the collective spirit. Even though we each have played together in different groups many times in the past, this was the first time this quintet as a whole had played together. In this music you will find our weaknesses and our strengths, be it that your thoughts on the subject will vary greatly from ours. My thanks go to Roger Richards and to the Australia Council for the Arts for the opportunity to spend this time of exploration with such incredible artists as the ones on this album.